<< Back VTTEST11N Cable Tracker with Tone Generator inc case. The VTTEST11N Cable Tracker, consists of a tone generator which generates a single 1500Hz or dual 1300 / 1700Hz square wave. The receiving probe, which detects the signal from the tone generator. Enables the operator to determine the cable route and if there is a break or fault in the cable. The Cable tracker has audible and visual indication. Supplied with carry bag, croc-clips and RJ network plug. 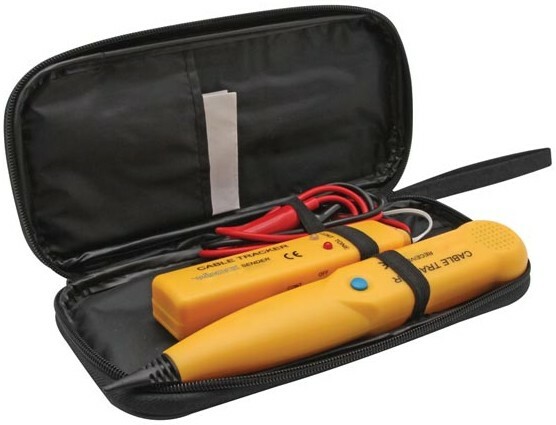 VTTEST11N Cable Tracker with Tone Generator inc case.